Think of them as "designer greens," these mixes that go far beyond lettuce with their flavors from sweet to spicy. Dean Okimoto's Nalo Farms has been providing gourmet greens to restaurants for years and has been trying to make them widely available in supermarkets. Processing issues held him up, but now he's delivering Dean's Greens to Foodland, Star and Don Quixote markets. The greens come in various combinations -- an Asian blend, for example, includes mizuna, tasoi, red mustard and curly cress. The price of $5 to $6 for about 4 ounces, may seem high, but you do get enough for a big salad. 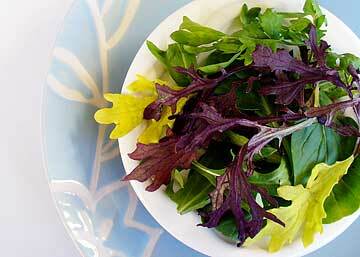 And compared to mainland packaged greens, these have a clear advantage in freshness and flavor. They're so tasty you can eat them plain, right out of the box. Speaking of the box, the greens come in a plastic container that breathes -- allowing for the escape of gases that rob freshness from greens sold in plastic bags. Okimoto says you can reuse the boxes to hold other vegetables, keeping them from yellowing.